Arrival at the Cochin International Airport. And transfer to the hotel. Overnight at hotel. 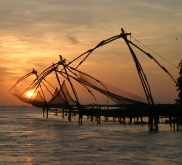 Cochin, former first Portuguese and Dutch trading has a cosmopolitan character is reflected in the diversity of styles, moods and architectures that reflect influences from around the world. Visit the church of St Francis, the first Christian sanctuary built in India, to stop Chinese fishing nets. Then, in the old colonial quarter Mattanchery visit the synagogue and the Dutch Palace, residence of the governor. Stroll the streets of junk and antique in the heart of the old town where the traditional district of spice warehouses located. In the evening, representation of a Kathakali dance show, spectacular combination of costume drama, dance and singing. Overnight at hotel. Drive to Alleppey between rubber and tea plantations. Alleppey is a nice little town on the great Vembanad lake and one of its main craft activities is the exploitation and processing of coir fiber from the bark of the coconut. Surrounded by canals, Alleppey invites a timeless journey through its backwaters. Bordered by coconut trees and paddy fields, they make the region one of the most picturesque of rural India. On the lagoons, one can observe the lake lives of its inhabitants go about their various occupations. It is a unique experience close to nature that reveals how they live over water. Getting on a houseboat for a leisurely cruise through the canals. Overnight on houseboat. Disembark after breakfast and direction Periyar Wildlife Sanctuary. The road leading to it passes inland and passes through beautiful landscapes. The tropical vegetation gives way to forests of pine and rubber trees and mountain takes possession. The Periyar National Park is located in the heart of the Nilgiri, the blue mountains, covered with plantations of tea, coffee and spices. In the afternoon boat ride on the lake, an artificial lake of 26 km² absolutely beautiful to observe hundreds of species of birds not to mention the wealth of tropical vegetation. then visiting a spice garden and a pineapple plantation. Overnight at hotel. In the morning, continuing the exploration of the park by a ride on an elephant. In the afternoon, drive to the factory tea processing Connemara and visit the plantations and the factory.This is a great way to understand the stages since the fresh leaf to the finished product ready for export through the drying and fermentation.Overnight at hotel. After a winding road through beautiful landscapes, arrived in the resort of Munnar. 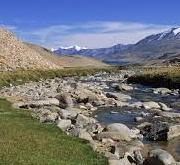 Located at 1600 meters above sea level, it was a popular holiday resort by the English at the time of the British Raj. The town lies in the valley of teas, Valley discovery in the first place by the Scots. Two varieties of tea plants are planted in Munnar: China and Assam. Visit a tea plantation and museum tracing the origin of this famous drink since 1880 and a pharmacy stocked with spices. This is the first museum of its kind in India, opened by the Tata company, Indian businessmen. Overnight at hotel. Morning drive to Madurai, the cultural capital of the Tamil country. Discover the city, one of the centers of Hinduism, and visit the gigantic Meenakshi Temple, the most famous place of pilgrimage all over Tamil Nadu, like a medieval fortress. The temple is dedicated to Goddess Meenakshi, Parvati and her illustrious husband, Shiva. The evening ceremony « sleep Shiva » who leaves the temple to reach the sanctuary of Meenakshi. Overnight at hotel. Continue to the bucolic Chettinad region, renowned for its craftsmanship, the quality of its food and the nostalgic luxury of its palaces. The area was inhabited by a community of very wealthy merchants and bankers, Chettiars and fortune allowed the construction of sumptuous Baroque houses and quite unique. The craft tradition is still very much alive in this region and can be visited workshops in wood, silver or a factory of earthenware and tiles, specialty of the region. Overnight at hotel. In the morning, drive to Tiruchirapalli Trichy familiarly called, the fourth largest city in the state of Tamil Nadu. The city of Rock probably owes its name to the rocky peak that dominates and it owes its existence. This remarkable and strategic site was an almost impregnable fortress in ancient times. Trichy has always been the seat of power in South India and numerous battle scars, often led by the French and the English, are still visible today. Mounted on top of Fort Rock to visit the temples. Visit the sanctuary Ranganatha Swami, true religious city dedicated to Vishnu whose streets and fortified sanctuaries form a labyrinth of several courses protected by the speakers. Continue to Tanjore.Overnight at hotel. Tanjore located in the fertile valley of Kaveri and often called theRice granary of India. The city has played an important role in the political history of this region for over a thousand years and was the capital of three dynasties: the Cholas, Nayak and the Maratha. Visit the Temple of Brihadeswara, Shaivite shrine, the jewel of the era with its high pyramidal towers rising to almost 100 meters. We remain silent in front of this imposing but nevertheless, has a beautiful harmony. Then visit the Maratha Palace and its museum, which houses a remarkable gallery of bronzes of kings and queens of the Chola period. Then visit a craft shop to see make bronze statues lost wax.Overnight at hotel. Departure to Kumbakonam and visit this ancient capital of the Chola empire in the 11th century and for about 250 years extended its control to Sri Lanka.Continue to Darasuram around and visit the beautiful temple of Airavateshvara remarkably preserved. A wonderful example of sculpture from this period. A Gangaikondacholapuram, discovered the temple, a masterpiece in itself. Before Pondicherry, visit the ancient city of Chidambaram, a fine example of Dravidian architecture. Continue to Pondicherry. Overnight at hotel. Pondicherry, a former French colony, bridgehead commercial interests the France India is full of surprises. Visit this city of good French accent still keeps the atmosphere of the old colonial trading. The streets intersect at right angles, still bear French names and many buildings reminiscent of that era. Visit the Sri Aurobindo Ashram, philosopher and poet who founded in 1926 with a French community that bears his name, now a meditation center. This ashram is very dynamic and very involved in everyday life. Walk in Tamil market and the Promenade, where many families find themselves. Overnight at hotel. Morning drive to Kanchipuram, the City of Gold, with 1 000 temples which 126 remain today. It was the capital of the Pallava dynasty in the 7th and 8th centuries under their rule, the city became the center of the Renaissance of Hinduism in the south. It is a sacred city for both its religious centers and the impressive number of temples it contained within its walls. Then, visit a factory saris and discovery of a silk weaving workshop, the city is known for its colorful saris and for over four hundred years.Continue to Mahabalipuram located on the Coromandel coast and considered the cradle of temple architecture in South India. Overnight at hotel. There are two thousand years, Mahabalipuram was a seaport known Roman merchants, Arabic and Greek. This is where the Pallavas established their maritime capital that flourished until about Siam, China or Fiji between the 7th and 10th centuries. The site consists of temples, a huge mural in low relief and high relief carved caves, the whole being a masterpiece of the time. Discover the extraordinary stone bas-relief, the "Descent of the Ganges', probably the biggest in the world, the Shore Temple erected on the sand by the ocean and all five Rathas, small temples cut in the shape of a procession of floats. Overnight at hotel. In the morning, drive to Chennai, formerly known as Madras, the capital of the state of Tamil Nadu. Gateway of South India entry, this beautiful garden city formerly consisted of several small villages scattered installed in the middle of rice fields lined with palm trees until it becomes the first counter of the East India Company. Visit the Cathedral of St. Thomas, the neighborhood of Fort St. George and the Kapaleeswarar temple. By late afternoon, transfer to Chennai International Airport for the return flight. Hotel uniquely situated to visit Tanjore. Comfortable, clean and friendly welcome. Quiet and large rooms.